Editor’s Note: The following is a reflection on the filming of the Ascension study, A Biblical Walk with the Blessed Mother, which was filmed in the Holy Land. Crossing the border between Jerusalem and the West Bank, where Bethlehem is located, is a surreal experience. The border is divided by an imposing concrete wall topped with barbed wire. It’s an unmistakable symbol of the ongoing sectarian conflict that occupies the region. As we crossed the border, it was hard not to notice the differences between Israel and Palestine. It was like watching “The Wizard of Oz,” but in reverse. The colorful and affluent city of Jerusalem was replaced by the drab and poverty-stricken region of the West Bank. Looking at the homes and the businesses, I wondered, “What must it be like to live here?” I felt two things in that moment: gratitude for the blessings I have, and deep compassion for the people of the West Bank. We began the day filming at Shepherd’s Field, where the angel Gabriel announced the birth of the Messiah to his Blessed Mother. As we made our way through the fields, we had to weave through a barbed wire fence while carrying our filming equipment. While it wasn’t easy, I can’t imagine what it would have been like for Mary to traverse this terrain nearly nine months into her pregnancy. We were carrying filming equipment. She was carrying the Son of God. From there we went to the Church of the Nativity. The Church is built over the cave where Christ was born. 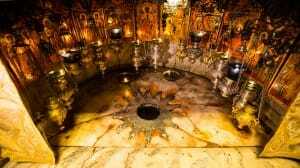 It was in that cave, nearly two thousand years ago that Christ came into the world. The Creator of all things was born into nothing. He didn’t have a nursery, or a changing table, or even a crib. Instead he was laid in a manger, which is a nice way of saying he had to sleep in a feeding trough. As we stood in that cave, I knew we would return to Jerusalem. We would leave the barbed wire, the dust, and the drab surroundings of the West Bank behind. We would have a shower, a change of clothes, and a nice dinner, before falling asleep in a comfortable bed. We would have all of the things Christ didn’t. I hoped that if I were living in Bethlehem at that time, I would have welcomed the Holy Family into my home. I would not have let Christ go without the basic necessities of life. The truth is, Christ is still in need. For when his brethren are in need, so is Christ (see Matthew 25:31-46). As you are celebrating the birth of Jesus, give glory to God in the highest for all of the blessings in your life. Then take a moment to remember those in need in Bethlehem, Philadelphia, Los Angeles, and in your own neighborhood. What is God asking you to do with the blessings he has given you? How can you share his love with others, especially with those in need? Have a blessed and holy Christmas. This blog post was originally published on The Great Adventure Blog in December 2013. The last question you ask at the end of a very descriptive story of your adventure focuses on a dilemma that has been in existence since the beginning of structured civilization. How do you help all those that are less fortunate? With prayer and guidance, perhaps I will learn to give more of myself and what I possess to those in need. i had the same experience when visiting the Holy Land going from Jerusalem to Bethlehem.as Catholics our social justice in the world should be non-negotiable.all people should have equal dignity,rights in terms of respect,access to resources and opportunity.your visit to honor the incarnation led me to the thought that truly honoring his incarnation is seeing Christ in all people.true compassion is doing something.the region is politically complicated.that should not be an excuse.social justice and true compassion is from Christ with us as instruments.so what can we do? the compassion, at this point, is to recognize and pass on to as many people as possible the social injustice in the region. most are truly unaware of this.i have hope that there is enough of humankind that also believes that social injustice is non- negotiable.